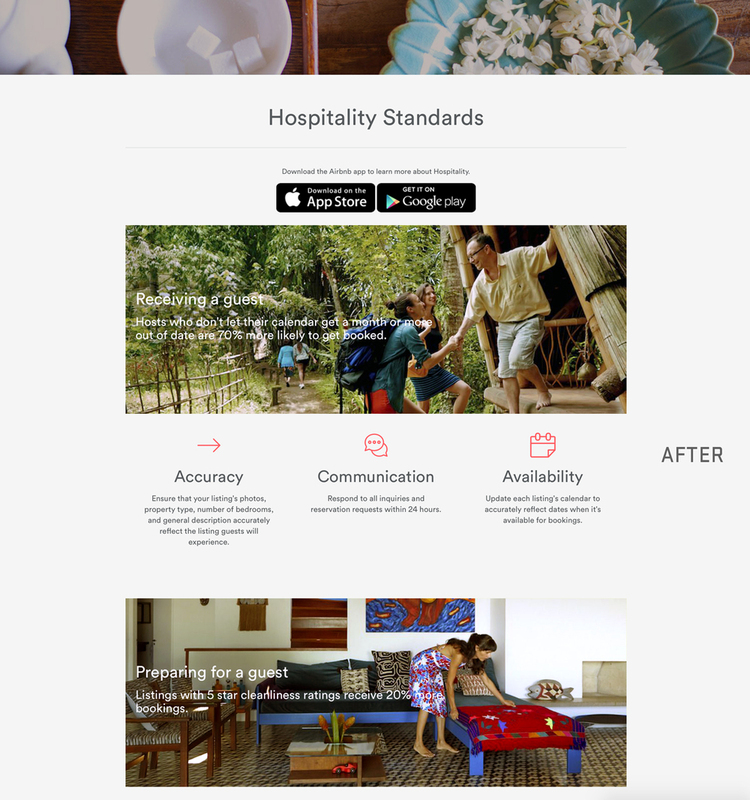 Below is a comparison of a full page spread from airbnb's website. The "Before" is how the spread currently appears on airbnb's website and the "After" is my suggested edit. Before Image: The top banner image (sugar cubes & flower pedals) is cooler with less than neutral contrast, while the following image of the man shaking hands is warmer with a yellow cast, much more contrasty, and has dense mid tones making the image appear heavy and unnaturally stick out from the others. Lastly, the image of the woman adjusting the quilt on the couch appears washed out and contains an unnatural green color cast over the entire image. After Image: The top banner image (sugar cubes & flower pedals) is now balanced in the highlights and mid tones to be consistent with the other images on the page. The image of the man shaking hands has been edited to maintain the warm feeling while removing the yellow cast, also I have corrected the dense mid tones of the image allowing it to pop yet not appear different from the rest. Lastly, the image of the woman adjusting the quilt on the couch has had the green cast properly removed, the skin tones properly match the other image, and the density of the image has been properly restored.